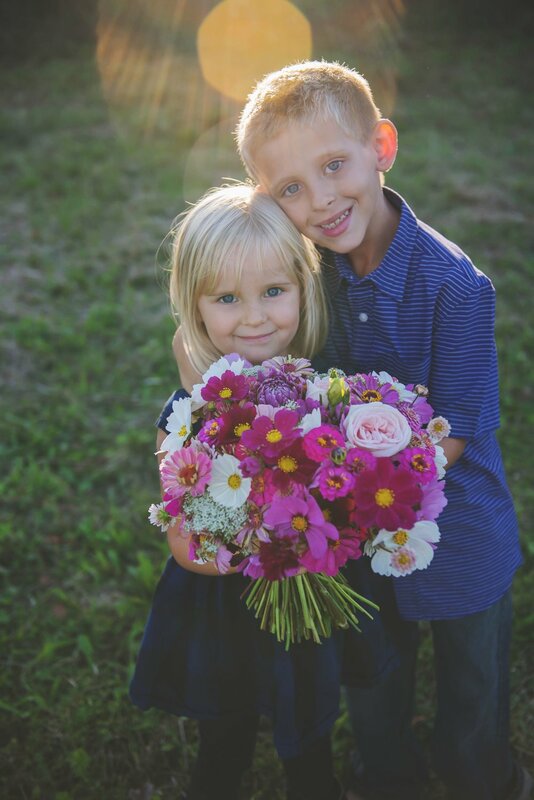 OUR FAMILY SPECIALIZES IN GROWING UNIQUE, UNCOMMON AND HEIRLOOM FLOWERS FOR SPECIAL OCCASIONs AND EVERYDAY USE. That's me on the left, Katy. I am passionate about so many things. It sort of gets me in trouble; I do and have done A LOT of things. Here’s the short list: Daughter, Sister, Friend, Student, Banker, Web Designer, Teacher’s Aide (Special Ed), Audio/Visual Tech, Roommate, Soldier, Bartender, Girlfriend, Veteran, Homeowner, Fiance, Realtor, Wife, Quilter, Fitness Enthusiast, Knitter. MOM. And now, Flower Farmer. I am taking risks, making mistakes along the way, but, my kids see me trying and for me that's the most important thing to teach them. And I love being with Dale. And he loves farming. And I love flowers. Perfect fit. Dale. Do I need to say anymore than workhorse? Probably not. He’s the MAN behind the rest of us. He runs this show outdoors. Tractor. Four Wheeler. Brush Hog. Plow. Rototiller. Mini hoe. Auger. Weed mat burner. But before all of that, he was amazing boyfriend. He’ll hate me for writing this, but this guy wrote me a letter EVERY. SINGLE. DAY. while I was overseas. We have legit love letters that I look forward to sharing with these kiddos someday. He's sort of a big deal. If all that weren’t enough we are equally obsessed with peonies, roses and dahlias. Probably not great for our bottom line, but we get some good pillow talk out of it. This is why we do it all. We wanted a way to show the kids how great country life could be. Both Dale & I grew up in the country; Dale very close to his dad’s family dairy farm, myself on 20 acres. We have always loved flowers and stumbled upon a need for a local, sustainable fresh flower option in the greater Madison area. Short for Madeline Elizabeth. She is spirited, independent, affectionate, funny, sassy, young and wild. Her spirit is exactly what we hope to cultivate in our little flower farm. Her first name, Madeline, comes from one of our favorite spots, Madeline Island in northern Wisconsin. Elizabeth, her middle name, is shared with Grandma Beth (aka Grandma Ding Dong), Great-Grandma Betty, and Great-Great-Grandma Lizzie. All who were brave, independent and strong women. And all just a little bit mad. Wink, wink. Farm Order Pickup Hours: By appointment. Roadside Stand Days and Hours: Join our newsletter list to be the first to know when the roadside stand is stocked. Bouquets may be reserved online for pick up in the stand here. Where can I find your flowers? Most flowers and orders are pre-sold through our online shop. We do have a roadside stand with limited items that are available as a la carte purchases. Those bouquets and succulents can be found by clicking HERE. They are purchased online and then picked up from the roadside stand. We love to have such wonderful customers and friends and work on the honor system. You purchase the item online and then stop during our road stand hours and pick up your purchase. I'd like to come visit the farm and walk through your fields. When can my family and I come and do that? We will have "open farm" days as well as our U-Pick Sunflower Happy Hour events throughout the growing season. We are a working farm but this is our home. For the safety of our family, neighbors and pets, we ask that you make an appointment with us to visit. I'm a Bouquet CSA member, where and when can I pick up my flowers? Please check your inbox for information about your CSA membership. I love tulips and want to shower my office in them year-round. Can you help me? Mad Lizzie's is not your typical florist. We hand plant, grow and harvest (or source from local growers) seasonal flowers, foliage and fillers from our own farm. This means tulips will be plentiful in early spring but unavailable the rest of the year. This makes the joy of having those flowers even greater when they are in season. I love ranunculus and want them at my wedding. Will they be available? We love ranunculus too! If you have a specific flower you'd like for your event, we can possibly plant them for harvest given enough time. Please note that the season, weather and temperature play a huge role in the growth and blooming of flowers. We will make every attempt to make your event exactly how you imagine. Wait, I have another question! Still have questions we don't answer above? Contact us below and we can help you out.